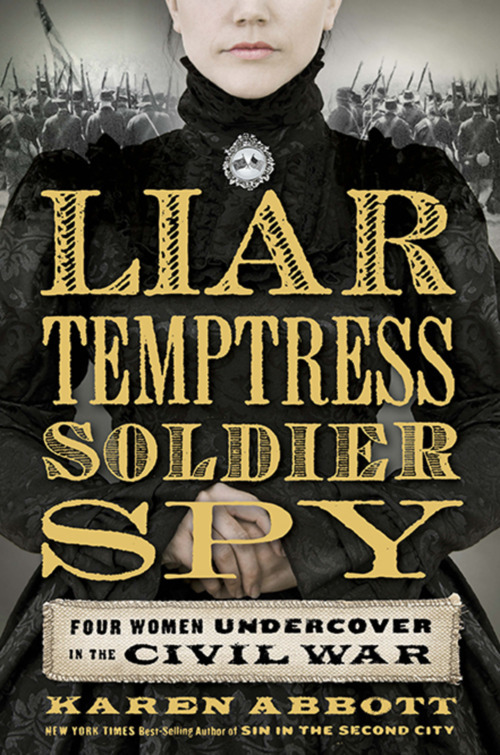 1) Liar, Temptress, Soldier, Spy examines women’s roles and how they changed when the men in their lives—fathers, husbands, brothers—enlisted in the Union and Confederate armies. What do you think was the most difficult aspect of being a woman during this time? Do you think most women considered their increased responsibilities a hardship or a freedom? 3) Emma Edmonds went furthest in upending gender roles, disguising herself as “Frank Thompson” to enlist in the Union army. How do you think Emma (and the other approximate 400 women who enlisted as men) pulled off this spectacular feat? What were some of the daily challenges they endured in living as imposter men among real ones? 4) Discuss the significance of the title, and how it applies to the lives and exploits of Belle, Emma, Rose and Elizabeth. When and how was each a liar, a temptress, a soldier, and a spy? 5) Belle, Rose, and Elizabeth all employed servants/slaves during their espionage missions. How did each woman’s treatment of her servant/s differ? Did any of their views on slavery evolve during the course of the war? 6) Elizabeth’s servant Mary Jane Bowser is both a key character in the book, and one of its most mysterious. How did her identity as an African American woman affect her role as a spy? In what ways did it make her job easier, or more difficult? 7) Discuss each character’s relationship with the men—both familiar and strange—in their lives. How did the women use men to their advantage? Were the women ever used themselves? 8) Belle looked up to Rose, a woman she met only briefly, and considered her a role model. In what ways were Belle and Rose alike, and how were they different? In your opinion, who was the more successful spy? How did Belle’s reputation as a “fast girl” assist—or hinder—her work on behalf of the Confederacy? 9) Rose’s daughter, Little Rose, is a crucial part of her espionage work. Do you think Rose was justified in using her daughter in her missions? What would you have done in her place? 10) Which spy did you relate to the most, and why? What motivated each of the women? If you had lived during the Civil War, would you have dared to behave as these women did? 11) Both North and South spoke of “atrocities” committed by the enemy. Which of these was the most shocking to you? In your opinion, did one side exaggerate more than the other? 12) What aspects of life during the Civil War surprised you the most as you read the women’s stories? How does this version compare to others you’ve read? 13) Abbott’s research sources comprise more than forty pages. Look through this section and discuss the process she undertook to reconstruct this history. How does it benefit a society to have free access to historical documents? Is there such a thing as “historical truth”?